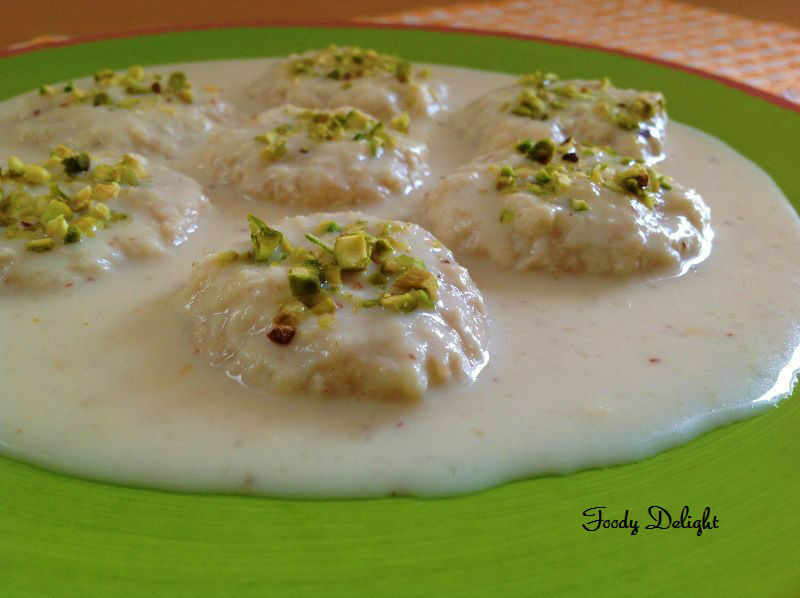 Earlier I had posted Angoor rabdi, which is closely resembles like Rasmalai . 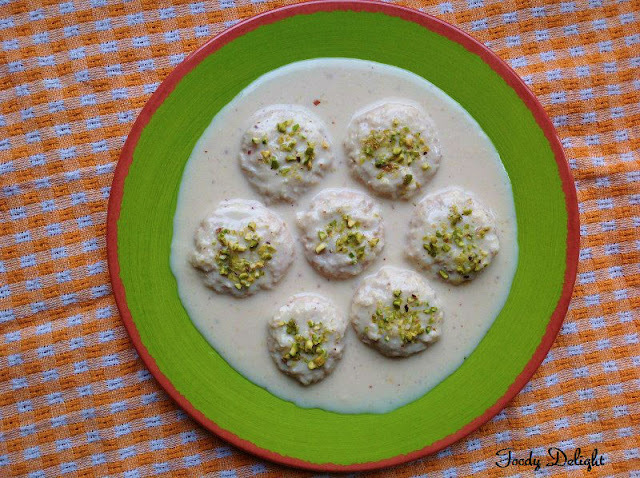 Both are the well known sweets of North India and most popular sweets of West Bengal. Rasmalai is prepared with rasgulla and sweetened thick milk that is called Ras. This combination makes the wonderful mouthwatering sweets. And taste great when served chilled. This sweet is not at all difficult to do, with little patience in no time you can make this recipe. So lets see How to make this Rasmalai. Pour the milk into heavy bottomed pan and bring it boil on medium flame. Stir continuously to avoid the burning of the milk at the bottom. When the milk comes to boil, lower the flame and slowly add the lemon juice into the milk.Stir gently. You will see the milk starting curdling.Then turn off the flame. Drain the cheese from the whey using the cheese cloth or muslin cloth. Rinse the cheese that is collected into the muslin cloth using the cold water, to take out the taste of the lemon from the cheese. Now squeeze out all the water from the cheese and press it under any heavy weight to remove any remaining water from the cheese atleast for 1 hour. After 1 hour,take out all the cheese on the clean plate. Knead it atleast for 4 to 5 minutes to make a soft dough. Divide the cheese dough into 10 to 12 flattened cheese balls. In one pot, combine the water and sugar and keep it to boil. When the mixture comes to the rolling boil, lower the flame and add all the cheese balls into the mixture. Boil the cheese balls into the mixture for 10 to 12 minutes. The cheese balls will be double in their size after cooking into the syrup. Take out all the cheese balls from the syrup,squeeze them a little and keep it aside. Add the sugar and chopped pistachios .Stir well and cook for 10 minutes. Then add cheese balls ..Let it cook for few minutes. Now mix in the cardamom powder . Garnish with chopped pistachios and serve chill. Muy buena y sabrosa me gustaría probar,abrazos y abrazos. Rich and delicious dessert. Looks so yum.. There can also be no higher feeling than appeasing your urge for food with the meals of your choice at the very moment you need to savor it. Indian meals are just yummy! You can not face up to the temptation of savoring the uncountable food! 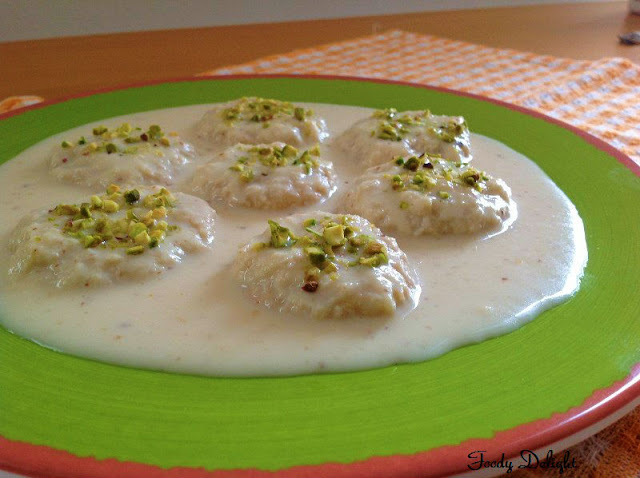 And varieties range - be it foods or sweets rasmalai recipe or chaat or namkeens, and extra, each variety is certain to delight your taste buds.